I first start out by cutting out a rectangle of the upholstery leather. I make sure that if I fold it in half I get two perfect squares. I fold the leather inside out so the rough side is on the outer part and the nice shiny side is on the inside. Turn it right side out and you have a finished pocket! I cut the rough shape of the closing flap to the pouch out of my thick leather remnant bag. It should be a weird slightly trapezoid shape with rounded corners. With my dremel I cut four holes in the trapezoid piece. I also cut 8 holes into the leather pouch. 4 on the front and 4 on the back. They should line up perfectly with each other. 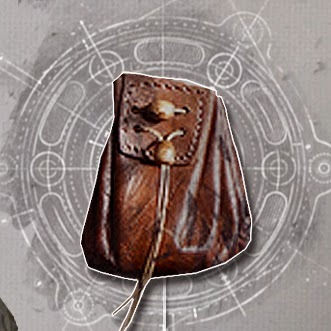 I put a coat of the light brown paint on my pouch and paint some texture onto it by adding splotches of the rich brown here and there until I found a color I really liked. I wasn't too happy with the shape of the bottom of the pouch so I folded the bottom corners in a little bit, put leather cement on it, and clamped it for about 20 min to seal the shape. If I had to do this project over again I would have perfected the pattern of the pouch before so I wouldn't have to glue. Instead of glue you could also just turn the pouch inside out and sew those corners closed. After that was done its time to assemble the pouch and sew the thick leather flap onto it. First I threaded one of my beads through the cord, making sure the bead is at the very middle of the cord. I took that cord and threaded each side through the FRONT of the closing flap, on the top left and right holes. Then I lined up all the holes on the pouch. I took the seams on the right and left and folded them inward so that all of the holes on each side are on top of each other. Once I did that I took one end of the cord with the bead and put them through the right set of holes and took the other end of the cord and threaded it through the hole on the left. Then the cord coming out the back of the right of the pouch goes through the back of the LEFT side holes and out the front. I did the same with the left cord, coming out the front of the right set of holes. Once both ends of the cord are coming out the front, I routed them through the bottom holes of the closing flap and put them both through the second bead. I trimmed the excess cord and tied a knot in both ends of the cord so the bead won't fall off. Then I proceeded to sew around the perimeter of the flap with the sewing awl and my waxed brown thread. This flap is ONLY connected to the pouch at the top seam. Once I turned to stitch down the sides, I didn't go through the pouch, only the thick flap of leather. The finished pouch, after I had taken a metal file and scuffed up the paint on it and made it look beat up. I added a leather thong to the back of it so it can slide onto my main waist belt.